Struggling to find the best housewarming gift? How about a stunning new doormat! Now, you might think that others may also give such a gift; if they do that’s ok because yours will be better. Why? Because your doormat will be completely customised! 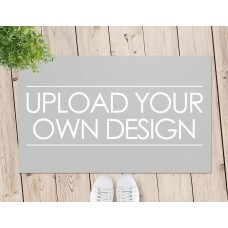 Our intelligent design interface allows you to customise a doormat to boast your unique message in a matter of seconds. Our generous text limits give you plenty of real estate to accommodate for even the most complicated family name. You even have the option of choosing a colour scheme to suit the household. For households seeking something a little more unique, we offer crest themed doormats and many other funky options. Represent the character of your family with a customised message for the outside world. Add a personal touch to any entry with your own message and make your guests feel welcome before they even enter the door. Our highly specialised printing machines ensure that all our designs are protected from fading, so colours will remain fun and vibrant throughout daily use. Once the designs have been submitted, you can receive them in one of two ways: Absolutely FREE – Come pick it up from the store, we’ll email you when it’s ready! Mail Delivery – we offer both standard and express delivery options Have the perfect custom design in mind? Start designing today!